If you plan to visit the Krabi region of Thailand, and I highly recommend that you do if you visit, you should definitely stay in Ao Nang. After spending plenty of time on the beaches of Koh Samui and Koh Phangan, I was ready to check out the Andaman side of Thailand in the Krabi province. 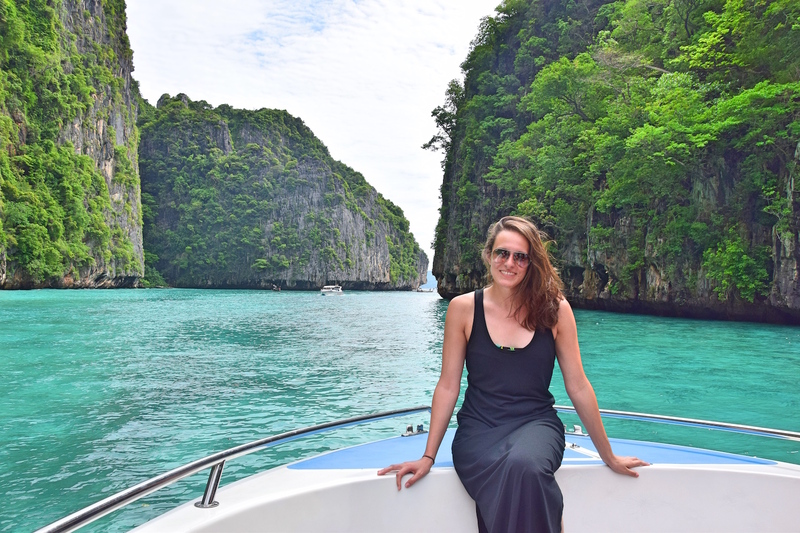 I had seen so many pictures of the cliffs, Railay Beach, and the crystal blue waters, I couldn’t let the Krabi side slip by me on my trip to Thailand, so I had to share it with you in this Ao Nang guide. If you’re headed to the west side of Thailand, I’d definitely recommend staying in Ao Nang, because it is the perfect jumping off point to explore Railay, and do some day trips to islands off the coast where you can snorkel and swim in some of the most beautiful waters around. From what I’ve heard, Krabi isn’t the most exciting place to stay, and most people only stay there if they are in transit, so Ao Nang is a better place if you plan to kick around the area for a few days. 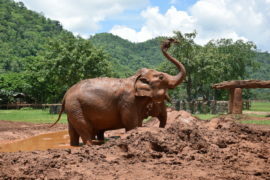 If you’re planning your trip to Thailand, don’t miss this 14 day Thailand itinerary. 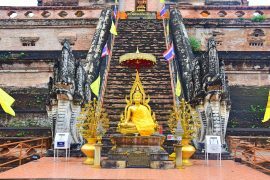 In this Ao Nang guide, you’ll find information about where to stay in Ao Nang and what to do in Ao Nang. 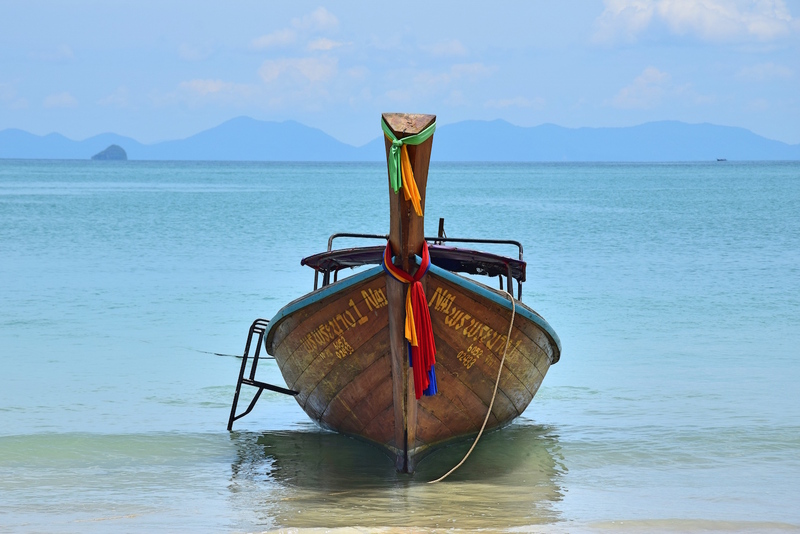 No Ao Nang guide would be complete of course without a tip on somewhere awesome to stay. When I booked my stay in Ao Nang, I decided to go “all out” with my accommodation. Luckily, going “all out” in Thailand doesn’t need to break the bank, and I was really excited to find a beautiful place to stay in Ao Nang for just $50 per night. When I saw Panan Krabi, I knew I needed to stay there. 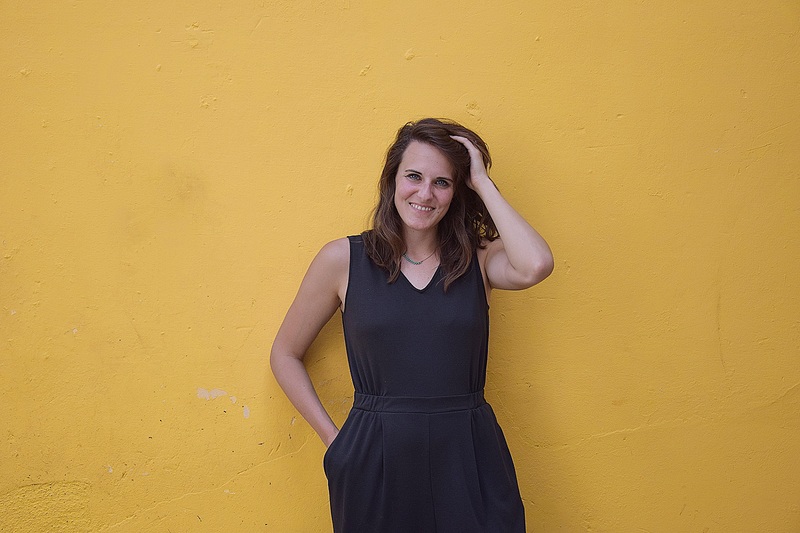 After staying in a few places that were more like beach huts than hotels, I was ready to feel a bit more connected with the world again and welcomed a comfortable hotel into my itinerary! The pools! 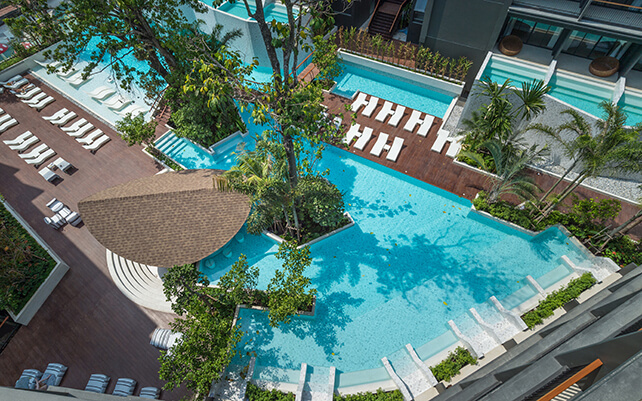 There are two lovely pools for you to relax by, both have bars, and one is a ROOFTOP pool. Need I say anything else? I spent quite a bit of time relaxing by the pool in the afternoon reading my book and just chilling out. You can get nice views of the karst cliffs around Ao Nang, and it is the perfect place for a selfie by the pool, although sadly I was traveling alone and didn’t dare to take a solo selfie. The pool on the ground floor is equally lovely and is a bit more popular for the guests visiting with children since there is a jungle gym in the pool. If you don’t feel like making a day trip, no worries, you can easily pass the time at one of the pools at Panan Krabi Resort. If you want to upgrade your stay a bit, you can also stay in one of their pool access rooms where you can jump directly into the pool from your room – how cool is that?! Sadly I didn’t stay in one of these, but if I go back I would definitely stay in one! The location! 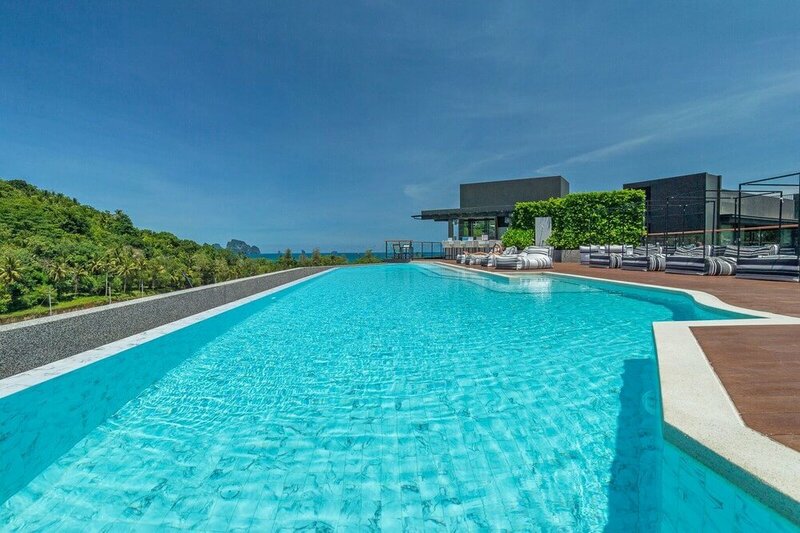 Panan Krabi Resort is located in the heart of Ao Nang, and is walking distance from restaurants and shops. 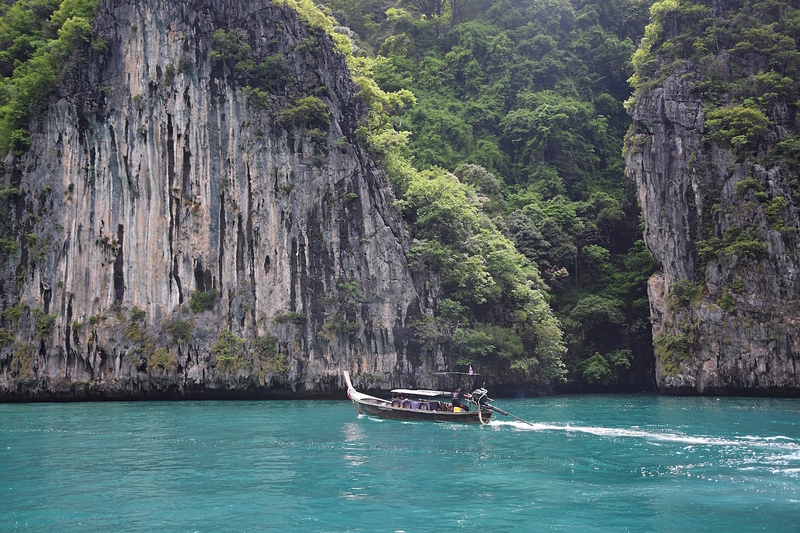 It is also walking distance from the boats that can take you on a day trip to Railay Beach – score! While most of the restaurants are the standard tourist fare, you will find a few gems in the mix, like a little hole in the wall local Thai place where a mom and pop will fix you up with delish flavors for a fraction of the tourist places (it sort of breaks my heart I don’t know what the name is, but it is just around the corner from Panan Krabi Resort). The rooms! Yes… I was in need of a bit of spoiling. I had been staying in a mix of ultra cheap and semi-cheap hotels during my time in Thailand and staying at Panan Krabi was just so comfortable. 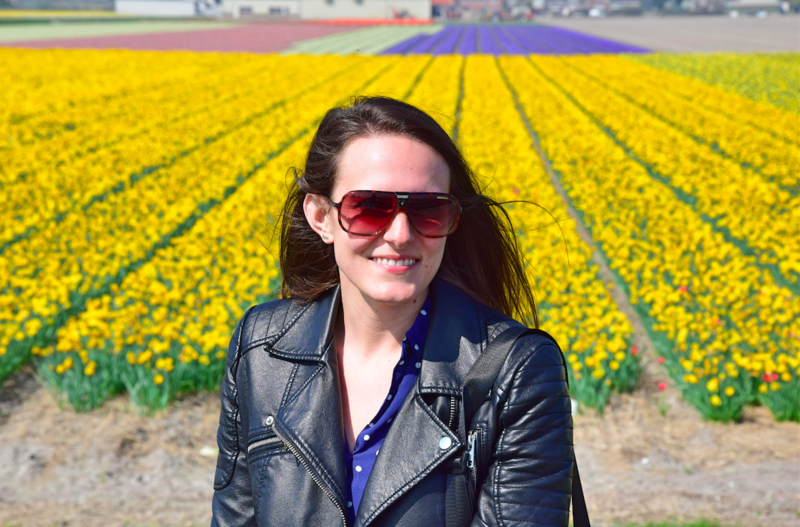 After I travel for awhile I tend to feel disconnected from the rest of the world – which is nice at first, but I eventually want to know what is happening in the world. Even getting CNN in the room was exciting to me (cheap thrills, right?). But seriously, the room was so comfy, the aircon was strong, and the bathroom was huge! I felt like I was soaking in a bit of luxury after a few weeks of flashpacking. The service! Ah yes, Panan Krabi is one of those lovely places that really make you feel welcome when you arrive with a refreshing drink and snack bar. Although I arrived really early on my day of check in, they helped me find my way in Ao Nang and pointed me in the direction of the Railay Beach boats. What made Panan Krabi stand out above the rest of the hotels I stayed in during my time in Thailand was that they really seemed to understand service and went out of their way to greet me and make sure all of my needs were met. There is nothing that annoys me more than booking an airport taxi the night before a flight, only to find out the receptionists have forgotten to confirm my booking. Thankfully there weren’t any hang ups like this and they arranged everything perfectly for my departure. Oh, and I should also mention the breakfast here – it is awesome! You won’t have to choose between factory made white bread or a runny egg the way you might need to at other hotels in Thailand – here you have a proper spread with tons of western food and pastries if you’re missing those! Panan Krabi was the best place to stay in Ao Nang – trust me on this one – earlier in my trip I sacrificed quality in favor of budget and I stayed at some places in Thailand that were definitely on the dirty side and had mosquito filled rooms. 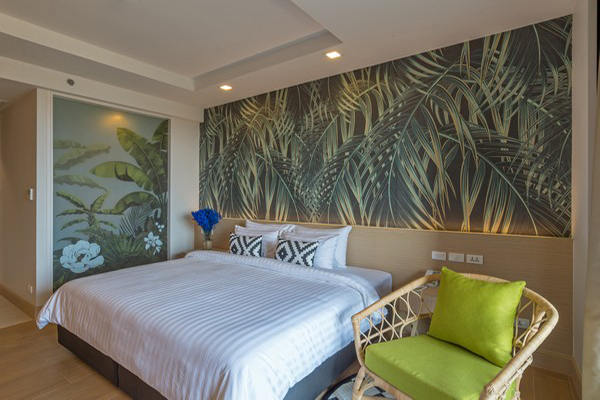 Thankfully Panan Krabi is NOTHING like that and is super comfortable and even a touch luxurious! Ao Nang is the perfect jumping off point to explore the beautiful beaches and isles that the glittering Andaman Sea is known for. While Ao Nang itself is not the most exciting destination, it is situated right by Railay Beach and striking distance to the Phi Phi Islands and Maya Bay. No Ao Nang guide would be complete without mentioning that these gorgeous places are close to you when you stay in Ao Nang. Beautiful Railay Beach with its turquoise waters and karst cliffs is just a short boat ride away from Ao Nang. You can easily take a fisherman’s boat to Railay from Ao Nang – you’ll find ticket booths at the beach selling tickets to reach Railay Beach. The boat ride over is only about 15 minutes, but keep in mind that you’ll need to wait until the entire boat fills up (8-10 people) until they will go to or from Railay Beach. No Ao Nang guide would be complete without the tip to visit Railay Beach, trust me on this one. Railay Beach, isn’t it beautiful? Once you arrive at Railay Beach you’ll be dropped off on the eastern beach, which I think is the most beautiful side of Railay. Arrive early if you want to snag a good spot on the beach and in the shade. You can easily reach the west beach by following the path that snakes between hotels and over to the other side. The western side is mostly known for its rock climbing. There may also be a cave there that is filled with phallic sculptures. Ok, I will confirm it – this cave IS filled with phallic sculptures. You need to see it for yourself! 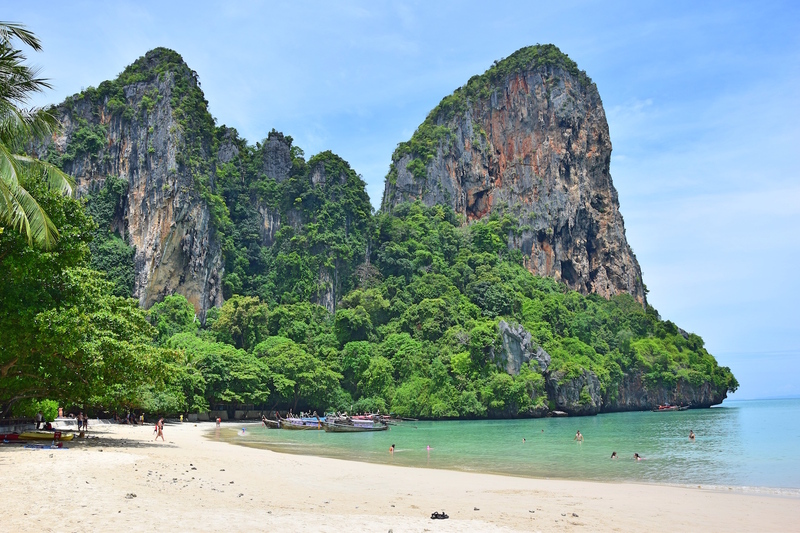 Railay Beach is the perfect day trip from Ao Nang, and is a great place to kick back and relax on the beach. I personally think Railay Beach is a bit too quiet to spend more than a day at, but many people like to come and stay here for several days – up to you! 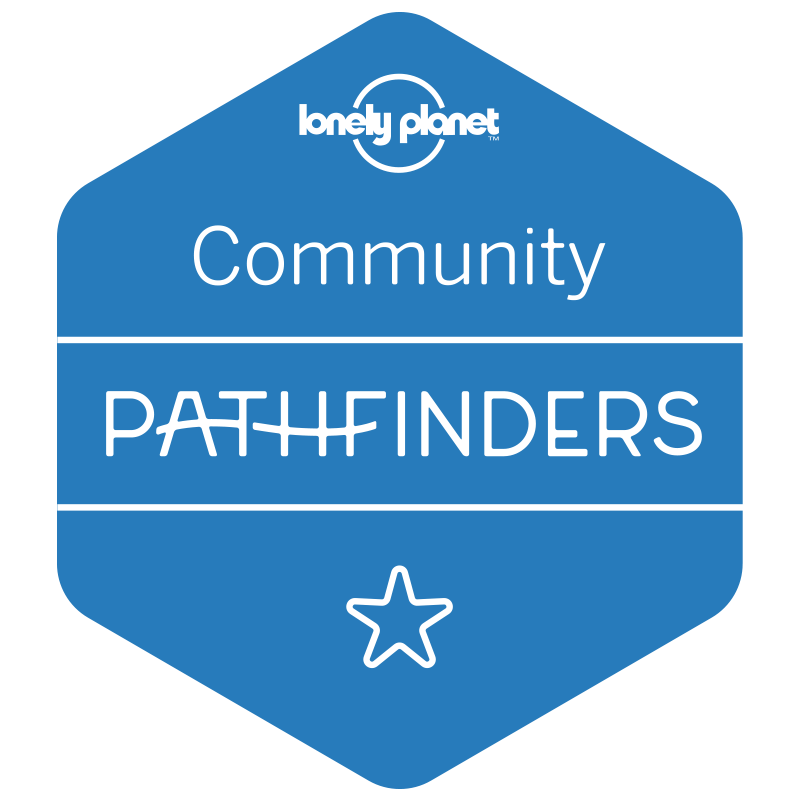 If you’re looking for more incredible Thailand beaches, check out this guide to Koh Lipe. These islands are what Thailand is famous for. Blue waters with karst cliffs jutting out of them and colorful fish swimming just below the surface of the water. If you visit the Krabi region and stay in Ao Nang, you can’t miss doing a tour of the Phi Phi Islands, Blue Lagoon and Maya Bay. These destinations are just as breathtaking in real life as they look on instagram, and your guide to Ao Nang wouldn’t be complete without them. Do keep in mind that these tours are extremely popular. I mean extremely. The day I visited Maya Bay was the last day it was open for tourism before it closed for at least four months. And I could see why. I try to be honest in everything I write, and I need to tell you the truth about Maya Bay in this Ao Nang guide. 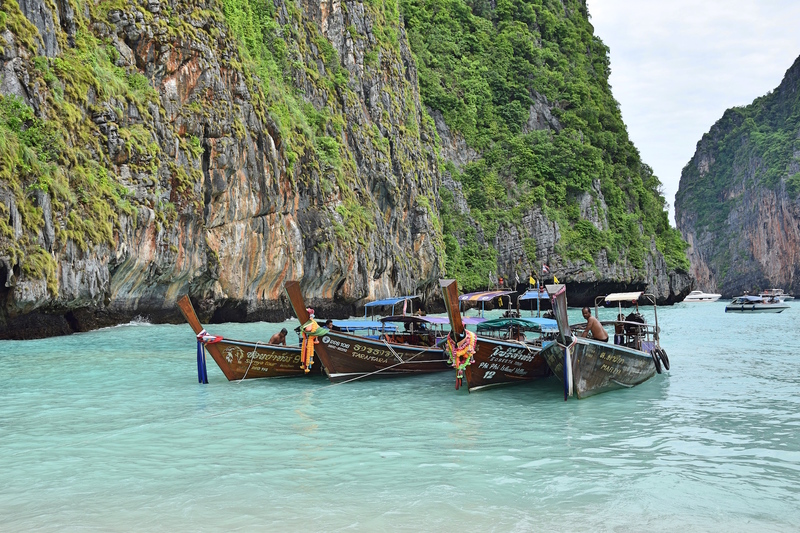 Maya Bay rose to fame after being featured in the Leonardo DiCaprio film The Beach. It is one of the most visited destinations in Thailand, and when I visited, there was barely any room for boats to park on the shore. The beach was filled wall-to-wall with people, nearly all of them waving a selfie stick. Honestly, it made me feel a bit guilty that I had come on this tour at all, since the island was about to close due to the deterioration of the environment. These beaches are so overcrowded, and that is one of the things I wish I had known before going to Thailand. Now you likely won’t be able to visit Maya Bay, and hopefully when it opens back up the Thai government will manage the tourism a bit better to ensure tourists can still visit, but maybe the numbers will be limited to preserve the beautiful nature there. When I planned my trip to Thailand, I knew I needed to see the Phi Phi Islands, but I knew I didn’t really want to stay on them, so this day trip was the perfect excursion to get a taste of what these beautiful beaches and islands look like, without needing to arrange a separate stay there. Most of these tours also feature a visit to the Blue Lagoon – seriously one of the most beautiful places I’ve seen – all of my photos look photoshopped but I swear they aren’t! The tours also typically include lunch and snorkeling gear, so load up on food and bring your GoPro to get some shots of the amazing fish that live just below the surface of these turquoise waters. If diving is more your thing, consider taking a trip to the Similan Islands after visiting Ao Nang for the best diving in Thailand! Fly to Ao Nang: You can reach Ao Nang via Krabi International Airport, which is about a 30-40 minute drive from Ao Nang. I flew on from Ao Nang to Chiang Mai (via Bangkok) on Thai Airways, but there are tons of other flights on AirAsia, LionAir, and tons of other South East Asian airlines. Take a bus to Ao Nang: When I arrived to Ao Nang, I was actually coming from Koh Samui. My favorite website to book travel in Thailand was always 12go.asia. 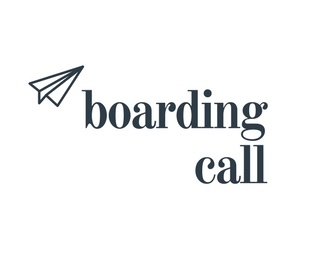 This website will be like your travel bible when you travel through Thailand – you can book ferries, buses, trains and even flights – and here you’ll find packages that connect them all. It really could not have been easier to get around Thailand due to how easy it was to book with 12go.asia. Did this Ao Nang guide help you plan your visit to Ao Nang? 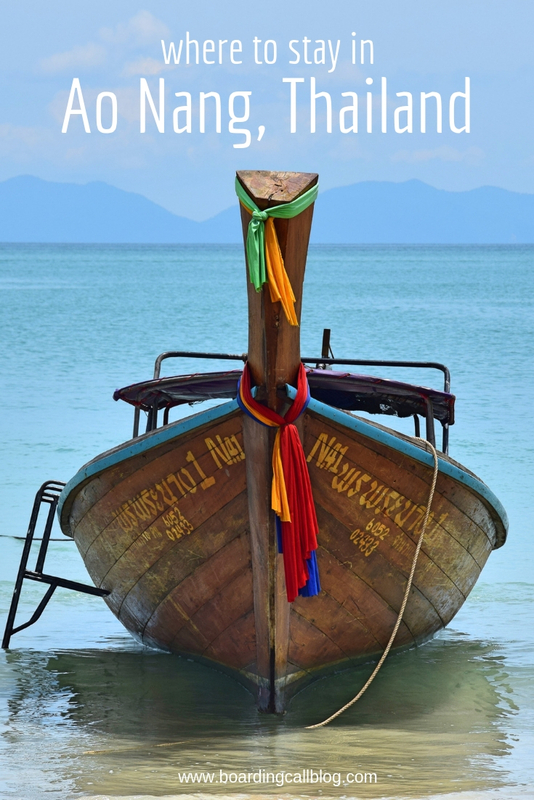 Let me know what you’d add to this Ao Nang guide! Your post conjures up great memories of our babymoon in Ao Nang way back in 2008. Now I’m just more determined to go back with our son like we always said we would!